So, some Bay Area californians are placing the prop 8 success blame on the Mormon church. The website intends to compare the oppression of gay rights and the oppression of Mormon rights to gain some ground with people of that faith. It points to an article listing 300 mormons that were against their church and Prop 8. 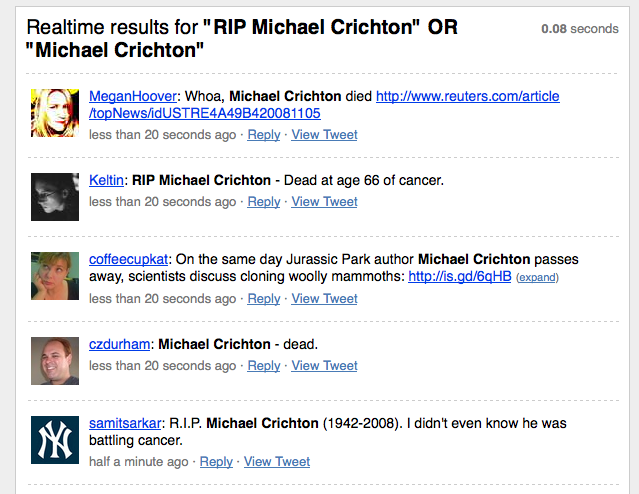 Twitter Search and Google Trends have the sad news of Michael Crichton’s death as their top issue. Twitter-ers are also tweeting about California and Proposition 8. Google’s volcanic topic is Rahm Emmanuel being tapped for Obama’s chief of staff. Of course, it’s Nov 5 so Guy Fawkes is on Twitter-er’s minds. 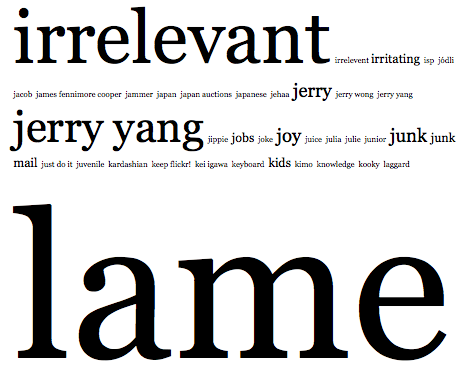 Now, what’s the hot topic on blogs? It’s Barack Obama by a landslide. Also, the news that Google broke its advertising agreement with Yahoo. I expect to see some Prop 8 blogposts in the near future. Google Dumps Yahoo: Was It Something We Said? Google announced today that it would not be going steady with Yahoo. They couldn’t get over the prenup, and some of Google’s friends were concerned about this relationship. So, Google thought long and hard about it. They even tried to give it one more shot, but today Google just wants to be friends. The breakup was done in a noisy restaurant…meaning today everyone doesn’t care unless you’re covering yesterday’s election, Prop 8, and the Senate race results. What does this mean for Yahoo? Well, it means that Jerry Yang and David Filo have to start thinking about the future of their company. This is the second big hit this week after Yahoo announced it would be shutting down its streaming video site Yahoo Live. So, good luck, Jerry and David. You guys just weren’t ready for a grown up relationship. I know, your hearts are broken. But there are other fish in the sea. 3 in the Morning: President Elect Barack Obama. 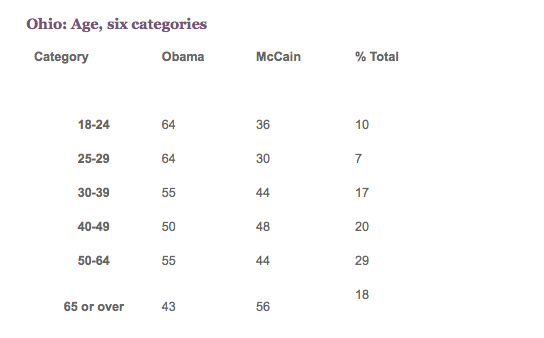 It’s interesting to note how every category sans the 65+ group went to Obama in Ohio. Once this state was called, it was over. 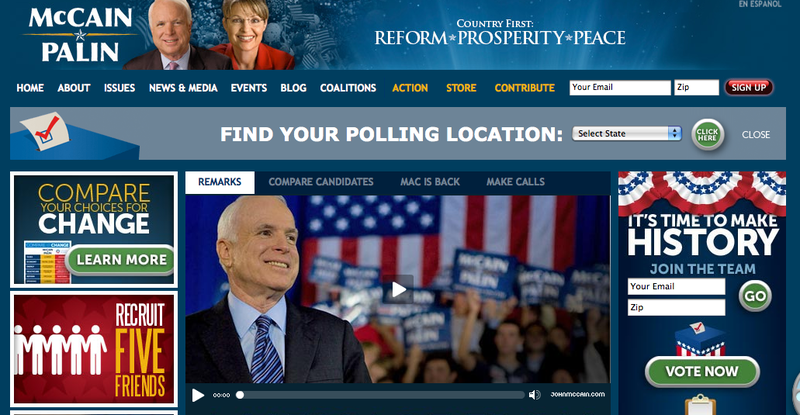 Here is McCain’s page with VERY LITTLE change (the developers just included a video of his remarks.) Obama’s website now gives visitors the chance to contribute to the RNC, but McCain’s website has yet to make these additions. I’m guessing the developers are worn out after a long day. So now we have our next president, and the tech community needs to be optimistic about an Obama administration. For one, he has always been a fighter for net neutrality. His call for net neutrality is even in his book The Audacity of Hope. We must also expect his administration to hold its promise to give government back to the people through technology. The huge coalition from this election should expect to see his text messaging and social network presence used to tackle his agenda. 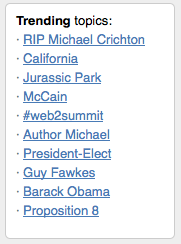 Google Trends, as of 3:31 AM, shows us that McCain’s concession speech became the volcanic topic of the day. It also appears that David Plouffe has gained some attention. People across the country are up late waiting for the results of Prop 8, which was leaning YES an hour ago. 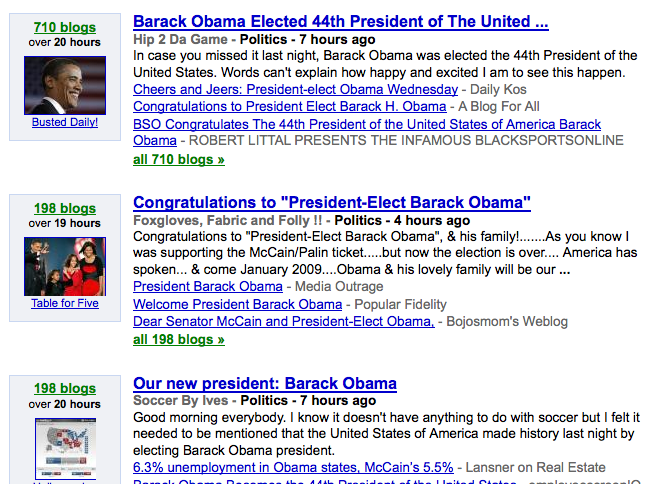 Obama mentioned Ann Nixon Cooper in his speech, and this has inspired some googling. Overall, Obama’s speech got the least attention and third place behind Obama’s campaign director Plouffe and McCain’s concession speech. Some of you might have noticed that “Uncle Tom” is a search term. And it might be related to two different types of stories: 1) The People of Natchitoches, Louisiana, where Harriet Beecher Stowe’s Uncle Tom’s Cabin is set, awaited the results of whether we had elected the first African American president. Or 2) it could’ve been Ralph Nader’s remarks this evening. Both were stories on major news outlets, but I’m going to vote for the latter as the cause. It’s been an interesting day, and I thank everyone that voted in his historic hard fought election. We should be thankful for 4 great candidates with 4 families that embody our hopes and dreams.